Today, Google revealed a project two years in the making. 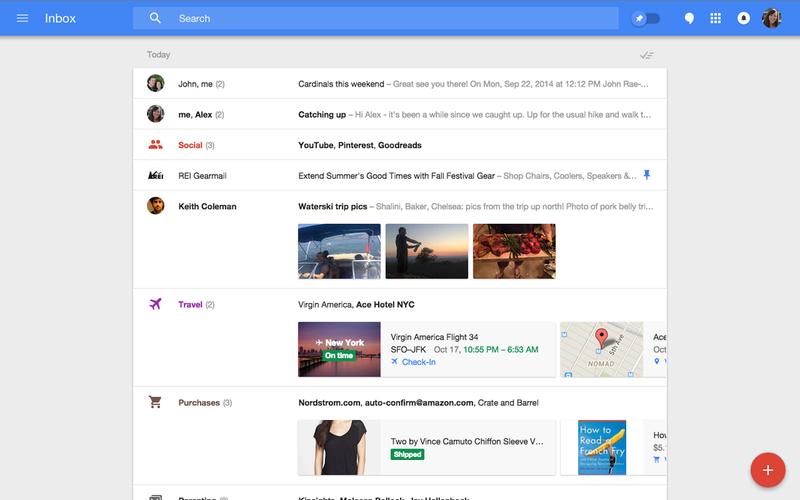 At first glance it looks just like a redesign of Gmail, and that's sort of half true. It's actually a completely new system called "Inbox" and it wants to reimagine your email. Google describes its major differences from traditional email in a couple ways. First, Inbox wants to make your email much more glanceable with what Google calls "Highlights." As the image above shows, if a friend sends you a picture or you get flight info for an upcoming trip, all that is displayed within your email feed so you can look without the click. Inbox also bundles together like email, similar to the "Social" and "Promotions" tabs, so you can keep similar information all in the same place. The service also displays up-to-date information much like a Google Now card embedded in your email in the attempt to help you keep track of the important stuff among the detritus and random digital ephemera in your inbox. Google takes this data-mining a step further with an improved reminders feature called Assists. Say you create a reminder for an upcoming doctors appointment, Inbox will immediately populate information into that reminder such as office hours and telephone numbers. Also, Google is introducing a snooze option, a popular feature on the email client Mailbox, that lets you resend emails at a time that's more convenient for you. Inbox is seen as a separate option from the traditional Gmail app. The Google team tells The Verge that they see users choosing one over the other—but not using both. There's definitely enough new features here to give Google's decade-old email app some impressive competition.